America can't be stopped, and neither can America's sports car, even if a bunch of them fell into a sinkhole! 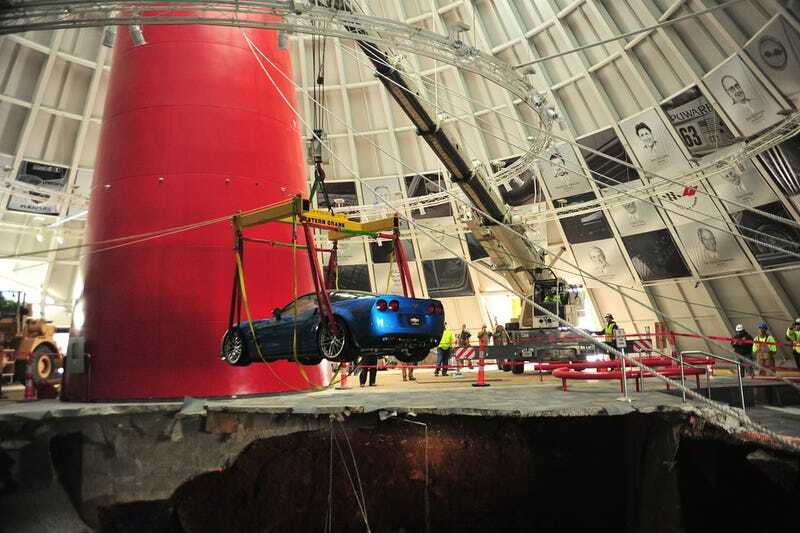 The National Corvette Museum continues to pull cars out of the hole that swallowed them up in February. Three of the eight fallen Corvettes have now been pulled from the hole. Right now those lucky cars are the 2009 ZR1 "Blue Devil", the red 1993 40th Anniversary Corvette, and a 1962 Tuxedo Black convertible. Five to go. In the meantime, here are some pretty impressive photos from the National Corvette Museum itself. You can see the full gallery here. You can't keep a good Corvette down! In a hole, anyway. Update: Look, they got the 1992 white 1 millionth Corvette too! Great work, guys. Four to go.